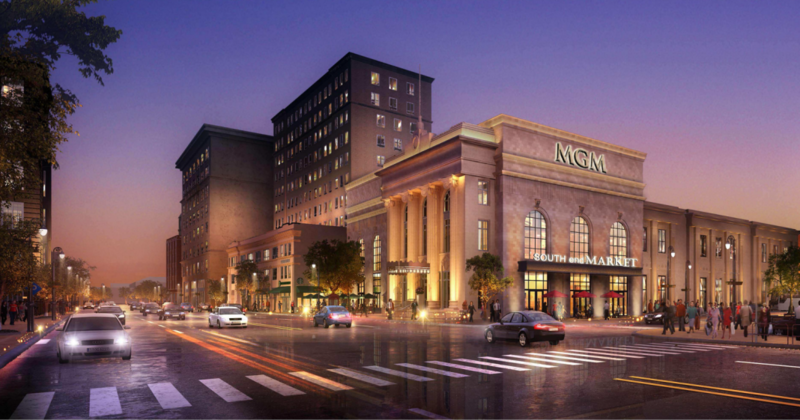 The fledgling Massachusetts gaming sector welcomed the inauguration of its first resort casino this week, with MGM Springfield opening for business, bringing 3,000 new jobs to the town. Cited as New England’s first integrated luxury resort, the venue combines the excitement and energy of Las Vegas with the rich historical context of Springfield, a city steeped in innovation and the arts. It joins Plainridge Park Racino to become just the second gambling location in the state. Covering three city blocks in the heart of downtown, the resort brings gaming to the town via a 125,000-square-foot casino floor that features 2,550 slot machines, 120 gaming tables, a poker room and high-limit VIP gaming lounge. Massachusetts Governor Charlie Baker, Mayor Domenic Sarno, Congressman Richard Neal and Gaming Commission Chairman Stephen Crosby joined MGM Resorts Chairman and CEO Jim Murren and MGM Springfield President Mike Mathis yesterday to commemorate the occasion. SBC Americas analysis: Massachusetts’ gaming market has plenty of growth potential over the next few years. The current brace of casinos will be joined by Wynn Resorts’ planned launch of a facility in Everett in 2019. Entry to the market there isn’t cheap, however, with casino licensees expected to invest $85m upfront for a license and upwards of $500m on developing their locations. What does Trump’s trade war mean for Macau casinos?